Hey, I'm Chris from the Isle of Wight. Currently own a Raleigh Arena GT, I believe 1970s. Hi I'm Henry from Bristol, posted a few things on here but no introduction! Came from fixed gear and had to buy a road bike a few years ago when presented with an entry to Liege-Bastogne-Liege granfondo by the father in law. Budget and style put me on a 90s Peugeot 'Competition 3000' and been getting carried away tinkering and selling (generally at a loss!) ever since. Peugeot is now running on Tiagra 4700 2x10 speed and I've recently been wielding a spray gun at some frames with pretty good results. Still got the fixed, and the fixed, and an aluminium (I know) winter trainer. The next one is a peach, a tongue in cheek retro with full Shimano 600 Tricolore, and definitely a keeper. Watch this space. I trying to get an early '80s Raleigh that I built in college and myself back on the road. I haven't ridden nor kept up with the bike scene for 20+ years. I just retired and moved to Colorado, USA. My guess is the Raleigh is a Competition GS frame - don't remember how I got it. It was built from a frame which didn't have with a model name. Anyone know what's up with that? Now I'm in Colorado instead of Wisconsin, I have no legs, and I'm 25 years older. I need much lower gearing in a major way. Feel like ol' Rip and a little shocked to find out Suntour no longer exists. I hate the thought of putting Shimano or anything modern on the bike. It seems old Suntour components might be easier to find over here? Hi. dr Nosh checking in. I was made aware of the forum via a conversation at l'eroica last weekend. I've always been interested in 'older' bikes, had a Raleigh Europa back in 1978(? ), bought from Canterbury Cycle Mart in errr Canterbury (Are they still in business). 1952 Claud Butler Jubilee. Built as a single speed for use in the 2009 LFGSS Tweed Run. 1977 Claud Butler Competitor. Built for 2013 l'eroica. 2017 Kinesis Tripster AT (Yes, I know, I'm weak, I succumbed to a modern fashion. But it is really a very comfortable bike. Lots of air cushion in those 40mm tyres. Checking in and saying hello for the first time. I've been a long time lurker and have enjoyed reading many threads but time to join in the hope of finding some help! I've been riding old bikes for as long as I've had the choice about what type of bikes I rode. A neighbour of my Nan kindly gave me an early Raleigh era Triumph roadster and I spent many an hour polishing and fettling instead of doing homework. University and life intervened and I'm now returning to the fold of old bikes (although I did spend a few years commuting on a 5-speed Pashley Sovereign Roadster... still my main bike for cycling with the family, although the 2009 date can hardly be considered old). The Triumph remains in pieces after being stripped and repainted in the wrong colour green by my dad... it's complete though and I'll get it together one of these days. I've been using a 1970's Wayfarer for a year or so as a runabout at work. I've recently acquired a lovely Raleigh Lenton with the intention of starting more touring/sports cycling. All three / four bikes (including the dismantled Triumph) I own use some from of SA hub, 3-speed (Wayfarer and Triumph), 4-speed (Lenton) and 5-speed (Pashley). There was no planning to this but I love the simplicity that these hubs bring to the look of a bike. I also love that over-speeding click-click-click in the higher gears too... especially on the 4-speed! Stumbled across the site looking for info via Google, on an old Claud Butler. I happened upon the thread about the Red Gillot and was mighty impressed with dumper full of info and advice and encouragement! So thought I'd try my arm!! Years ago my daughter had a stone built out house (Georgian) taken down and in the sealed up roof area was a Claud. Too big for my inside leg, the frame numbers are 522/513 this means, I think, it's as old as me (1951). It has a Gnutti steel cotterless chainset, a half eaten Hurret rear mech and lever, that's it in it's entirety! I'd like to restore it but time is few. Does anyone know of a Claud collector? I also have a half decent Woodrup that is also too big (see a trend here) and a Ron Cooper that's my size. The Woodrup came as a basket case. The Cooper I've stripped ready to restore but ill's etc held that up. Finally I acquired a Trek tri bike so I converted it to road, looks ok! Great meeting you today Steve, and thanks THM for the prod. Now I have the frame in my possession, I realise my initial thoughts are way out, I think its most likely to be a No7 “Closed Circuit” Mk1, this is by far the closest to its kit and details although there is one curved ball… The KROMO Chrome Molybdenum Steel tubing transfer. The "Closed Circuit" bikes are advertised in the 1949 Catalogue and the last reference I can find to Accles & Pollock tubing was in the 1948 catalogue, whereas this frame is clearly stamped up as built in 1951. Greetings from Canada! Long time lurker, first time poster. 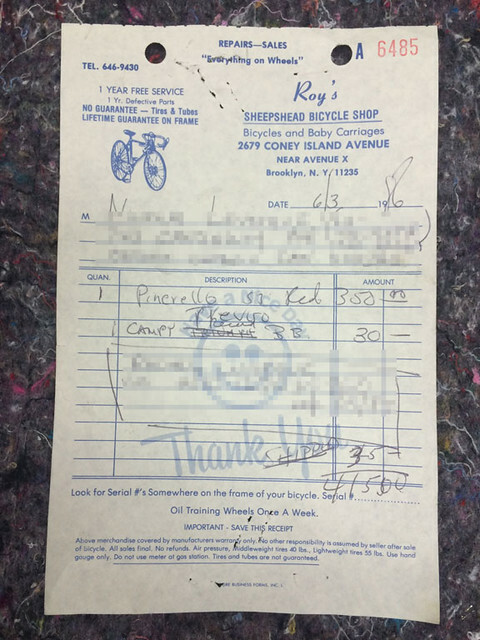 Proud owner of a ~1985 Pinarello Treviso that I’ve started restoring to its orignial Campagnolo NR spec. I will be starting a build thread soon and I’m looking forward to peppering you all with questions — and providing answers when I can.